The tennis court at 1131 Green Valley Rd. in Bryn Mawr. Forget about a private instructor. Anyone can engage a coach or trainer. True luxury is leaving the court and heading straight for your own en-suite bath for a soak and into your cavernous walk-in closet to get changed. These three homes boast private tennis courts and an assortment of other luxuries. Tell me all about it: This seven-bedroom Gladwyne estate is set on a nearly six-acre lot, which features a six-car garage, a natural stream-fed pond, expansive gardens, and a tennis court and pavilion. Inside, we love the master suite with its separate private dressing rooms and domed sitting room. Interior finishes include antique millwork and imported marble. Tell me all about it: Arbor Hill is a collection of houses and a 20,000-square-foot multipurpose barn with a gym inside. There is a three-bedroom main home and two guest houses (one with two bedrooms and one with four). The barn includes a sport court, an indoor tennis court, and a locker room with sauna. The property also includes outdoor tennis courts and pavilion, as well as a lovely pond. Tell me all about it: This Main Line home features a main residence with an attached guest house. Between the two homes, there are seven bedrooms, six full baths and two powder rooms. 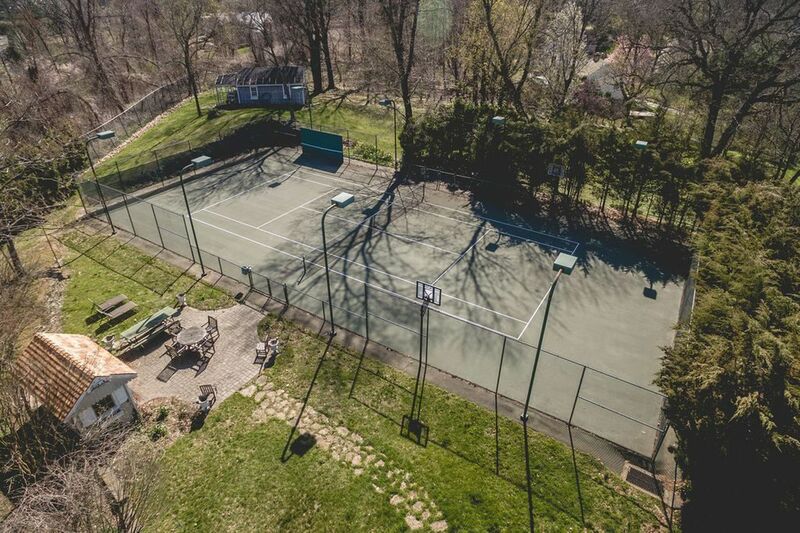 The property is on 4.23 acres, where you'll find an exterior tennis court and an in-ground pool.